For a more detailed match-up press system, see "Match-up Press Defenses". This is a similar, but simpler match-up press that might work better for younger teams, or teams that have limited practice time. This press attempts to force up the sideline and trap near half-court, or intercept the pass. Diagram A. The offense has one guard up. X4 puts pressure on the inbounder and denies the center pass, forcing it to the corner. X5 does not let the defense get the ball in the middle, but forces to the side. Once the ball is passed into the corner, X5 will attack and try to keep the ball on the sideline. As the dribbler moves up the sideline, X1 and X5 set the sideline trap. Meanwhile, once X3 sees the ball going up the sideline, he/she should move to that side also, looking for the interception. While this is happening, the opposite guard X2 must sprint back to prevent the lay-up. Here is a key issue… after the inbounds pass is made, X4 must move quickly above the ball (at all times), and should be able to deny the pass to the middle, while X3 denies the pass up the sideline, and X2 is back to prevent the lay-up. Diagram B. The offense has two guards up. Here we move X2 up to the free-throw line also… and again we deny the pass to the middle and force it to the corner. All the same rules apply as in Diagram A. X4 must get above the ball and deny the center pass. X2 still must prevent the lay-up and will have to sprint a longer distance. Diagram C. Use this against the 4-across press breaker. X1, X2 and X5 are up while X3 prevents the lay-up. Play man-to-man. Keep the pass out of the middle. If the pass goes to the corner, X4 could try to trap this immediately. Diagram D. Here we are going for the quick inbounds steal, or the 5-seconds call. This time X4 plays off the inbounder and picks up the remaining player. All four players (X1, X5, X2 and X4) play in the passing lane, between the ball and their man (see diagram), completely denying the inbounds pass. Don't worry about getting beat on the long pass since we have X3 back to prevent the long pass and lay-up. 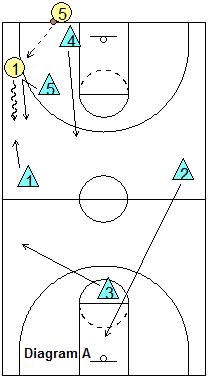 For this to work, we must set up very quickly (oftentimes best after a time-out or dead-ball situation). Every defender must work hard to deny the pass. If one person slacks off, it fails. Next, see "Match-up Press Drills" to learn how to teach the match-up press. with Jim Calhoun, former Head Coach UConn. with Kevin Sutton, former collegiate assistant coach and high school head coach.